XML vs JSON Shootout: Which is Superior in SQL Server 2016? Starting with the 2016 release, SQL Server offers native JSON support. Although the implementation is not perfect, I am still a huge fan. Even if a new feature like JSON support is awesome, I am only likely to use it if it is practical and performs better than the alternatives. Today I want to pit JSON against XML and see which is the better format to use in SQL Server. Full disclosure: I don’t love XML and I also don’t love SQL Server’s implementation of it. XML is too wordy (lots of characters wasted on closing tags), it has elements AND attributes (I don’t like having to program for two different scenarios), and depending on what language you are programming in, sometimes you need schema files and sometimes you don’t. SQL Server’s implementation of XML does have some nice features like a dedicated datatype that reduces storage space and validates syntax, but I find the querying of XML to be clumsy. All XML grievances aside, I am still willing to use XML if it outperforms JSON. So let’s run some test queries! 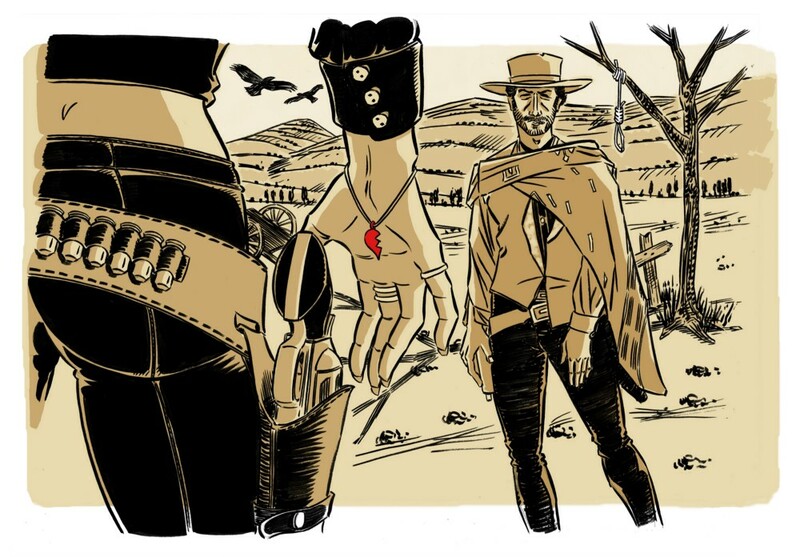 Is JSON SQL Server’s New Sheriff in Town? Although performance is the final decider in these comparison tests, I think JSON has a head start over XML purely in terms of usability. SQL Server’s JSON function signatures are easier to remember and cleaner to write on screen. So XML should be larger right? It’s got all of those repetitive closing tags? Turns out the XML is actually smaller! How can this be? This is the magic behind the SQL Server XML datatype. SQL doesn’t store XML as a giant string; it stores only the XML InfoSet, leading to a reduction in space. The JSON on the other hand is stored as regular old nvarchar(max) so its full string contents are written to disk. XML wins in this case. And the results? Inserting the 100 XML rows took 613ms on my machine, while inserting the 100 JSON rows took 1305ms…XML wins again! I’m guessing since the XML data type physically stores less data, it makes sense that it would also write it out to the table faster as well. I’m incredibly impressed by SQL Server’s JSON performance when compared to .NET — but how does it compare to XML on SQL Server? Result? JSON wins (at 0ms vs 63ms for XML) when needing to pluck out a fragment from our larger object string. What if we want to grab a specific value instead of a fragment? Once again JSON wins with 0ms vs 11ms for XML. In addition to the cleaner syntax (JSON_MODIFY() is essentially the same as a REPLACE()) the JSON insert runs in 22ms compared to the 206ms for XML. Another JSON win. Result? 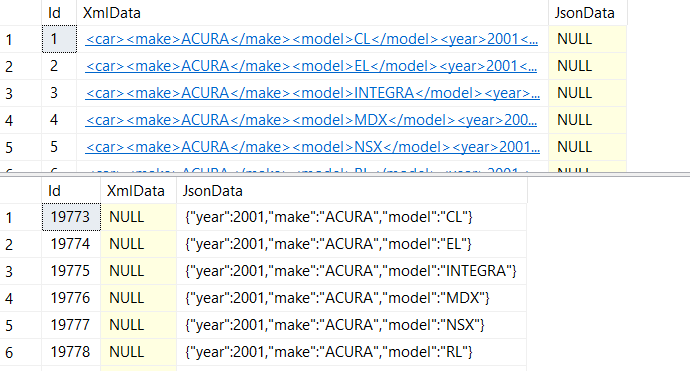 JSON has the quicker draw and was able to perform this update in 54ms vs XML’s 194ms. Deleting large string data, a DBA’s dream *snicker*. JSON doesn’t take any time to reload and wins against XML again 50ms to 159ms. So above we saw that JSON was faster than XML at reading fragments and properties from a single row of serialized data. But our SQL Server’s probably have LOTS of rows of data — how well does indexed data parsing do in our match up? Now that we have our expanded data in our table, let’s add some indexes. The XML datatype in SQL Server has its own types of indexes, while JSON simply needs a computed column with a regular index applied to it. XML is able to filter out 96 rows in 200ms and JSON accomplishes the same in 9ms. A final win for JSON. If you need to store and manipulate serialized string data in SQL Server, there’s no question: JSON is the format of choice. Although JSON’s storage size is a little larger than its XML predecessor, SQL Server’s JSON functions outperform XML in speed in nearly all cases. Is there enough performance difference to rewrite all of your old XML code to JSON? Probably not, but every case is different. One thing is clear: new development should consider taking advantage of SQL Server’s new JSON functions.